I've got a sore thumb. I spent three hours yesterday making a Meccano model with my eight year old son. It was really hard! But we had a fantastic time and we've now got a working motorised forklift truck (and loads more models we can make in the future too.) I'm impressed. A lot of parents are looking for toys that will get kids away from a computer screen but will actually absorb them and take their full attention. Meccano is definitely worth a look. But if you're not familiar with the toy, or haven't seen the recent sets then it's worth finding out a bit more to make sure you buy the right toy. I didn't have Meccano as a child so I hadn't really used it before. Obviously I'd heard about Meccano, known as Erector in the US, in all those interviews with engineers who said that making metal models as kids had put them on the right path for their future careers. But this was the first time I'd sat down and used the stuff. Our set is the Meccano / Erector 8540 Multimodels 40 Model Set. 40 models is a bit misleading - the manual only has detailed instructions for 16 models. There are just pictures for the others and I can't find instructions online (which we would be perfectly happy with.) Having said that 16 models is loads and the models are very interesting and varied including a robot, an elephant and a knight as well as vehicles and machines. 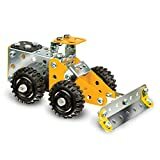 Modern Meccano is a construction kit that uses metal pieces in a variety of shapes along with plastic gears, washers and accessories plus rubber drive belts and other small pieces. The main assembly technique is connecting metal plates using small nuts and bolts. Many Meccano kits come with instructions for several models that can be built from the same pieces but not at the same time. The models often have mechanical moving parts. Larger sets include motors that can be used to automate the models. The first thing I noticed is that it's gorgeous. The set we have has metal pieces with a sparkly purple coating. The promotional pictures of Meccano don't really do it justice. The other thing we noticed as we worked is that the model we were building got really big! It was much larger than my son expected. Usually with construction kits it's the other way around. Our Meccano set says age 8+ on it. My son is 8 and can easily make LEGO sets that say age 12+ or 14+. Meccano isn't LEGO. Now part of this is probably that my son has played with LEGO pretty much every day since he was 4, but Meccano is much harder than LEGO. Kids need really good fine motor control to connect the pieces. This isn't a bad thing. Fine motor control is a very useful skill to develop, and one that likely suffers when kids spend so much time in front of screens. I'd say 8+ is about right. I'm sure some 8 year olds will really struggle with the patience and detailed work involved. While there will be kids who excel at this sort of thing who will be able to start earlier. Many 8-10 year olds are likely to need help. You can get smaller sets which take less time to put together, but they still require the same skills. There's also a Meccano-Erector Turbo range of racing cars for age 7+ which could be a good place to start for some children. Meccano sets tend to have several models that can be made and with the larger sets each model can take several hours for a novice to build. There's a lot of building time in a Meccano set. And of course once kids have mastered the techniques they can start to build their own machines. For the right child a Mecanno set will be brilliant value for money. It does require patience though. In addition to the Turbo race car range, Meccano has Evolution and Multimodel sets. The Evolution sets are realistic and functional models that focus on doing one thing really well, though they may still include a small number of different models to make around a theme. The Multimodel sets on the other hand sacrifice perfection in specific models for the ability to make lots of different models from the same set of pieces. TIP: It's also worth tightening up models when kids are getting started so that they don't work loose too quickly. I've spent a lot of time retightening bolts and it's much harder to do this once the model is built than as you go along. It seems inevitable that bolts will work loose over time especially with the vibration caused by the motor. For 2015 Meccano have developed some new tools to replace the old ones so look out for sets that contain these. The new hex tool looks easier to grip than the old one. I might not have got sore thumbs if I'd stuck to using the tools but I was helping my son and we only had one set (we'll be picking up a small new set just to get a set of the new tools.) I'd definitely recommend learning how to use the tools properly. As well as the official Meccano tools I found a magnet on a stick really handy for holding bolts in place after they had fallen out and I didn't have room to get my fingers in. If you're not sure whether a child is ready for Meccano yet then you can start with one of the smaller sets. This is one of the new small sets for 2015 which makes 5 different models. This set uses the same techniques that the larger sets use so it's good for developing skills. The recommended age is still 8+ - kids will need to be able to fasten the nuts and bolts using the tools. For maximum value for money go for a multimodel set. There's more likely to a model that really appeals to the child and there's loads of replay value. A big set that includes a motor will maximise interest. Note that in our set the battery compartment was fairly tricky to build and needed first, I helped out with this so that my son could get on to the more interesting parts without getting too frustrated. Our Meccano set came in a plastic suitcase which is quite useful but it doesn't have any dividers, we ended up putting a craft storage box inside it. I'd recommend getting a toolbox or craft storage box with lots of compartments to store the Meccano in. It's much easier to find the pieces you need if they are all sorted. Meccano will be a challenge for a kids who haven't done a lot of intricate detailed work using tools. It also requires a lot of patience. Many parents will consider this a good thing - fine motor skills and patience are useful skills to develop. 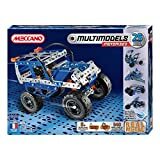 For some kids Meccano will be a toy that comes out every now and again when they are really interested in one of the models or have an idea of their own to build. For others it will really capture their imagination and will help them develop skills they will use in their future career or hobby. Definitely worth a try.